The 10-minute hearing on June 20 was set to take place on June 16 but it was postponed after Judge Berman accepted U.S. Attorney Preet Bharara’s request for a delay on June 15 due to his heavy work schedule. Zarrab’s lawyer, Benjamin Brafman, complied with the request to reschedule the hearing. In light of Zarrab’s continued incarceration, his attorney, Brafman, asked Berman in the June 20 court hearing to set a trial date for early next year so the case could move along rapidly. Brafman also said he was considering whether to appeal the bail decision, and plans to file a motion to dismiss the indictment against Zarrab. Arguments on that potential motion were scheduled for Sept. 6. Zarrab was the prime suspect in a corruption and bribery scandal involving the Turkish government that went public on Dec. 17, 2013. The businessman is accused of being the ringleader of a money laundering and gold smuggling ring in Turkey that circumvented sanctions against Iran. The charges were dismissed after prosecutors investigating case were accused by the ruling pty and then-Prime MinisterRecep Tayyip Erdoanof plotting against the government and removed from their posts. Four former cabinet members, EU Minister Egemen Ba, Economy Minister Zafer Çalayan, Interior Minister Muammer Güler and Urban Planning Minister Erdoan Bayraktar, were accused in the probe before the cases were dropped. Erdoan and the ruling AKP accused the followers of the U.S. based Islamic scholar Fethullah Gülen of using the case to plot against the government, before launching a huge crackdown on the group in state institutions, security bodies, and the private sector. Erdoan also accuses Gülenists of spying on himself. Bharara included the Turkish graft probe claims in the indictment against Zarrab, which was opposed by Brafman. The fact that the probe was closed down is in fact further evidence of Zarrab’s relationship with influential Turkish officials, Bharara said, adding that Zarrab posed a flight risk and may never appear in front of a U.S. court if he was released on bail due to his substantial family and business contacts abroad. Bharara said Zarrab had passports from three countries, enabling him to easily travel to countries from which he could not be extradited, with Judge Berman saying the court wanted to receive the passports currently held by Brafman. 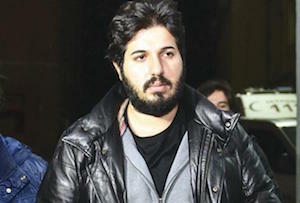 Other than his Turkish passport, Zarrab also holds Iranian and Macedonian passports. The 33-year-old was arrested in Miami in March en route to Disney World with his superstar singer wife and five-year-old daughter.